Aurora Borealis (Northern Lights) seen over Colville Lake in December, 2012. This is one of roughly five aurora photos that I’ve ever taken in my entire life on this planet. *Note: Please take this post with a grain of salt, it is intended to give you a chuckle more than anything. I can’t stand aurora photos. There, I said it. Anyone who knows me well, knows that pictures of those waving green globs of goo drive me up the wall. I’m not exactly sure when it happened, but I know it was sometime shortly after my first few months in Yellowknife. I recall being asked to judge an “Aurora Photo Contest” for some ad agency and they wanted my opinion. At first, I was captivated. What beauty! What glorious angels could harken such lights to appear ‘cross our blissful night sky? I swear that Eros, himself, was playing ten thousand flutes just for me! I looked at another. And then another. And then another. And one more still. And more after that. This continued for over 3 hours and I think Eros and the angels said “Screw it, we’re outta here” because the beauty and wonder was completely and totally lost. At the end of that session, I couldn’t look at another aurora photo – it became unbearable. 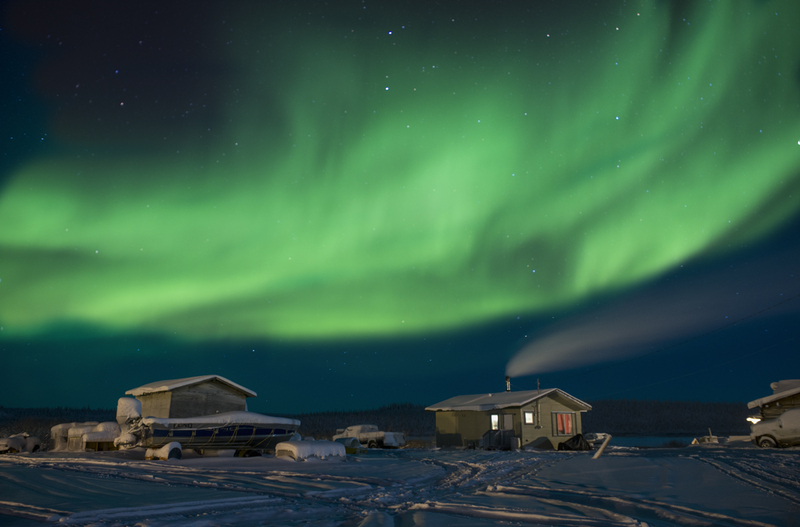 Fast forward a few weeks after that, as I was settling into my new job as photo editor at Up Here Magazine, a general interest publication that covers Canada’s Far North. I would often ask photographers for pitches: “Send me some work and your ideas – I’d love to see what you have!” And there it started again. Slowly but surely aurora photos would creep into my emails. Aspiring photographers would show up with portfolios full of aurora photos. And worst of all, during our annual photo contest, my inbox would be absolutely flooded with the unsightly pictures! Green blobs with trees at the bottom. Over and over and over again, they continued to pile in. Wasn’t there anything else in this beautiful, spectacular North that people could photograph? What about the people? The culture? Anything but this godforsaken aurora! And then, after several thousand aurora photos, I became numb. My inner aurora had faded. “Could this really be happening?”, I thought. “Um, well I do but not very many,” I said. “Well, we really want to show people what the North is like, and an aurora picture would be perfect,” the voice on the other line said. “I’ll check my archives and see what I can dig up for you,” I said. And that was it, my first (and probably last) aurora request from that client. So I guess the joke was on me. For whatever reason, for whatever purpose, those pictures of green goo really resonate with people. It is what the Statue of Liberty is to New York or the Eiffel Tower is to Paris. The aurora is loved around the world, and for that I must step back and graciously accept defeat. People have asked me if I actually and truly hate the aurora, and my answer is of course not. I guess for me, the magic of the aurora doesn’t happen when I haul out a clunky tripod and fiddle around with my camera and look at it on my computer. Sometimes you just gotta look up, take it all in, and be totally awestruck and happy with where you are in the world. I’m with you Pat. Well said. Stick to your guns despite all those pesky requests for something “really northern….like aurora”. The north has a lot of other things going for it! Love your comments on the Aurora. Spent 4 nights in Whitehorse last year and had the best Aurora night ever (Feb 14) but hadn’t really honed my skills at Aurora photography. Had 14 nights in Whitehorse this year and Aurora showed up for an hour on one night. Thank goodness the Yukon Quest was absolutely amazing!! !